The Islanders will face the Capitals-Hurricanes winner, a series that can't end before Saturday and could extend until next Wednesday. The long layoff will bring some needed rest in the midst of a physical postseason run, particularly with the status of defenseman Johnny Boychuk and right wing Cal Clutterbuck unclear after both exited in the second period of Tuesday night’s 3-1 win in Game 4 at Pittsburgh. Coach Barry Trotz had no immediate update after the game, and the team did not practice on Wednesday. But long stretches between games is not an optimal model for maintaining peak performance. The Capitals hold a 2-1 edge on the Hurricanes heading into Thursday night’s Game 4 at Carolina and that series could be over as soon as Saturday or extend until next Wednesday. If that series goes to Game 7, the Islanders likely wouldn’t resume play until April 26. Trotz coached the Capitals to their first Stanley Cup last season and is admittedly way more familiar with his former team. If the Islanders do play the Capitals, Trotz’s dressing-room declaration to his former players on Nov. 26 as he was presented with his Cup ring that “You’ll have to go through the Island, but you guys can do it again,” will no doubt be replayed over and over. “When I said it, I believed it,” Trotz said. “If it happens to be Washington, what I said will be played forever on every newscast. They’re a strong hockey team that has the goods to do it again. They’re a special group and they’ll always be a part of me. If we end up playing them, they’re the opposition. The Islanders split their four-game season series with the Capitals, with the visiting team winning each game. 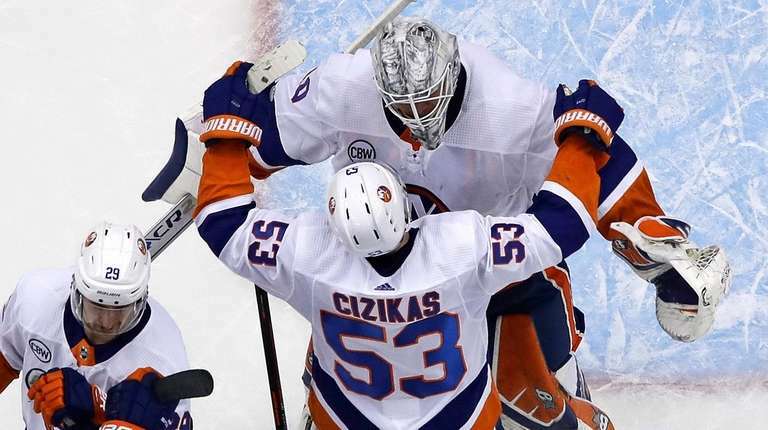 The Islanders clinched home-ice advantage with a 3-0 win in the season-finale at Washington on April 6 as the Capitals rested several key players. The Islanders won three of four from the Hurricanes, including a 2-1 win at Carolina in the season opener on Oct. 4. The teams have not met since Jan. 8.